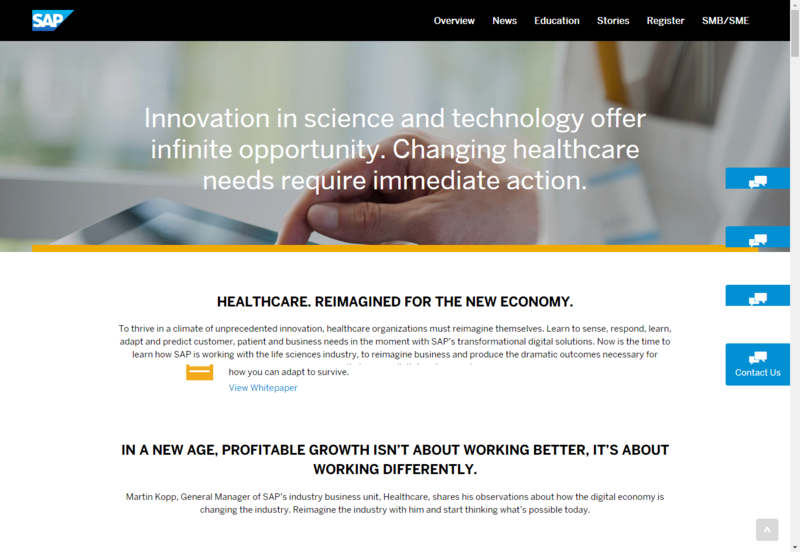 Read how the marketing team at SAP executed this expansive campaign, and drove over 9 million impressions. This case study is a Reader’s Choice nominee for the MarketingSherpa Summit 2017 Awards, the third of four that will be published over the next two weeks. SAP was chosen by our panel of judges for the team’s dogged pursuit of not only topic relevance for customers, but consideration over how the customer would best absorb the content. The group was able to remain thoughtful of what content would bring the most value throughout a massive content campaign that could have easily become overwhelming. “We are a global organization with a highly matrixed marketing department. One of our core marketing competencies is that we go to market by industry, fine-tuning both our products and messaging for 26 vertical industries,” said Ginger Shimp, Marketing Director, SAP North America. Often, she added, they also message at the sub-industry level. SAP, which is a multinational business operations and customer relations software corporation, has marketing teams that are focused on content development, demand generation, social media, paid media, and events, among others. 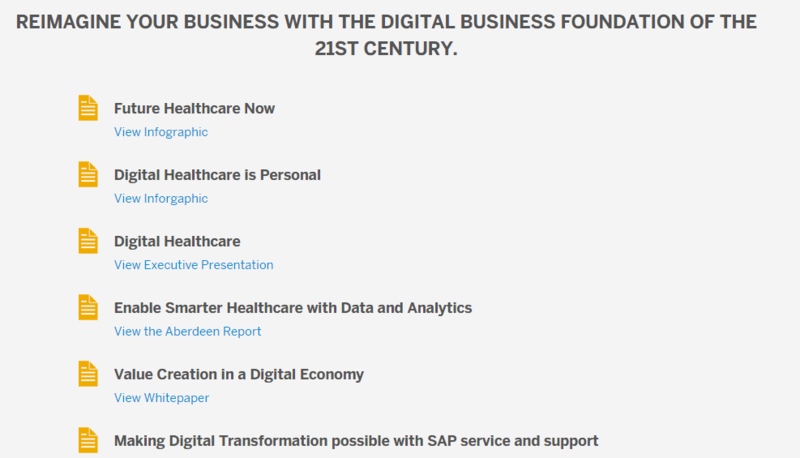 In this campaign, SAP came up with 19 industries that hit across the spectrum. “We have retail and consumer industries. We have utilities and public sector industries, [and] financial services industries like banking and insurance. We have manufacturing industries, healthcare life sciences-type industries, professional services industries … construction. We had oil and gas, utilities, wholesale distribution, just across all industries up and down the supply chain,” she said. The challenge for this campaign was to develop industry-specific content to fill a full campaign reaching out to these groups. A major challenge of this “digital transformation”-themed campaign was how to rise above the noise in the marketplace to reach these personas with valuable content. She explained that it is a different set of solutions depending on the industry, what stage of growth the company is in, and what their legacy products are. With such a large campaign covering a wide swath of customers, another challenge was making sure it didn’t spin out of control. Especially since this campaign required having several different agencies working alongside Shimp, some writing additional content, and others developing themes that would envelope the entire campaign. “You could imagine with so many industries, you could very easily wind up with disparate campaigns. We really wanted to hold it together,” she said. With so many people working to execute, putting up different landing pages, email messaging, event signage, remaining disciplined on the desired message was vital. 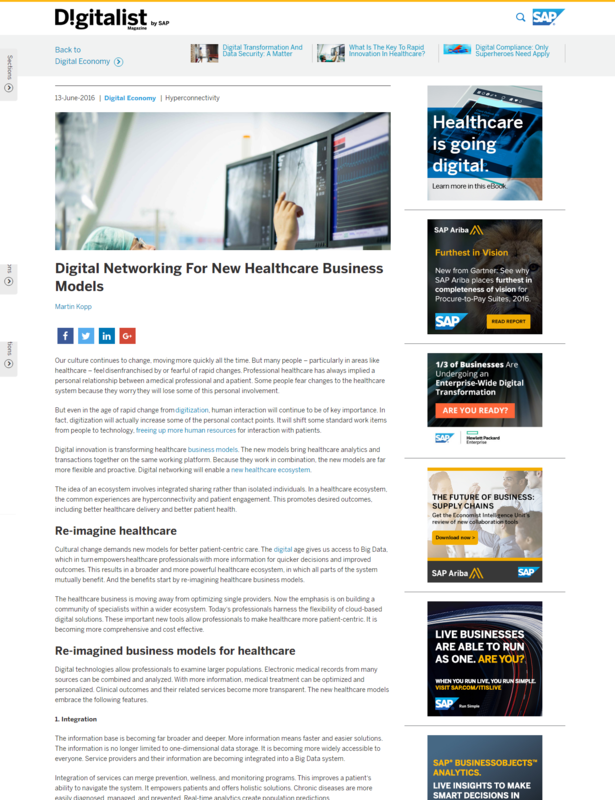 By tuning the messaging around a hot topic like digital transformation specifically to each industry, SAP was able to uniquely appeal to each customer audience, and demonstrate the benefits with examples from their own ecosystem. “We adhered to the buyer’s journey in terms of targeting the multitude of assets we had developed. We also worked to ensure that we played to the various ways in which people consume information,” she said. “People's capacity to communicate in real time, not only with each other, but with businesses … that's growing and growing,” Shimp said. 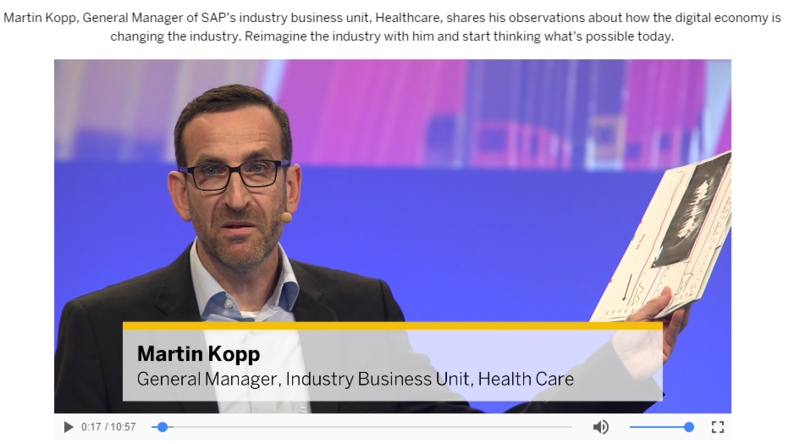 This incredible ability to connect and follow in the current digital age convinced SAP that customers had to be given those options through immediate access to content and data. From their vantage point, Shimp and her team saw how business processes are becoming harmonized across all functions. “What that means is connected networks, memory platforms, those are providing that immediate access. It's right here, it's right now. We hear about real time. What we're seeing is there's almost a step up from real time. How do you communicate that? That was what we were after,” she said. In this far-reaching campaign, it was vital to not lose sight of the individual customer. Then, work out from there. “We have line of sight, and pick a single customer. Not only … for what that customer is doing, but what that customer's peers are doing and what that customer's supply chain is doing,” said Shimp. Part of working with an individual customer mindset is figuring out how they want to digest the content you’re creating. “Some people, they need something that feels live … so we did videos. We had our experts giving talks in sort of that TED talk format,” she said, explaining that they also created video versions of white papers because hectic senior executives might not take the time to sit down and digest a 20 to 30-page whitepaper. “They can digest a four-minute video. They can forward that to somebody else and say, ‘See what's behind the curtain here,’ if you will. That person would be the one to download the full whitepaper,” she said. That would hopefully lead to some content exploration, which would have the senior executive come across thought leadership pieces put out on blogs, executive-level PowerPoint presentations posted up onto SlideShare, or even attending an event. All of the different platforms were spawned from an original white paper, unique for each industry, and grew out from there. One of the biggest assets for this campaign was in-house talent, according to Shimp. Shimp and her team started to develop the content, and decided that the white paper was going to be the seminal piece of this campaign, where “just about everything we need to know will have been captured in the whitepaper. From there, we could really go to town from a marketing perspective,” she said. Everyone working on, or near this campaign, “is a master of our own industry from a marketing perspective,” she said. Shimp is currently responsible for two industries, but at the time she only had one. “So I would not dare to make a decision for one of my colleagues. That's their area of expertise. While we're all phenomenal marketers, once you paint us with our own area, that's what winds us up and gets us running,” she said. One of Shimp’s colleagues volunteered to contribute to the campaign, since he was working on one with a similar topic. He brought a fresh perspective, she said. They wanted to run the campaign with industry specificity, and then back up to show customer what digital business meant overall, or more broadly. He suggested flipping that model, and starting with a broad message that would keep narrowing to a point. “Both of them are valid. We're glad that we did both ways,” she said. Nothing went wrong with running this campaign inverted from the rest, she added, but it was always out of sync. Even though that tactic didn’t lead to anything, it was a good lesson, she said, because they learned that the campaigns work best set to the same model. There was so much content to develop and push out, it wasn’t able to get done in such a short amount of time, she said. “We have this great information and we don't want to hold it hostage. We want to shout it from the rooftops. We want to just parachute it on top of the mountain with bullhorns blasting this great information for people to consume,” she said. That desire has to be balanced, Shimp added. “On the other hand, we have shareholders. So we actually need to sell some software along the way and we need to generate demand,” she said. She and her team decided to drip out smaller bits of ungated content, to pull people in, and tease more valuable content. “Many of our tactics were absolutely free. You do not have to register to get this information. Then we would just hold close to our vest some information so that we had a way of determining who was really interested so we can put them in a nurture queue,” she said. “We're continuing to measure because we didn't drop all of the industries at once. New industries were coming in,” Shimp said. It’s been important to remember that one industry can’t necessarily be compared to another, she added, and they are currently evaluating the aggregate results. “We’re looking at how we can take the campaign, parse it up and pull it into account-based marketing,” she said. 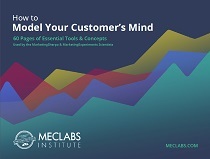 The goal is to go into those accounts, and analyze how to bring relevant information to customers in a personalized way that will deeply resonate. Marketing generated opportunities (MGO) equaled $3,675,000. MGO’s are new opportunities created from marketing leads that have been accepted by sales and converted into opportunities, according to Shimp. The marketing touched pipeline (MTP) equaled $50,037,709 in this campaign as well. MTP comprises all open opportunities that have at least one qualifying marketing activity after the opportunity creation date. “That's what we're trying to do. Streamline this as we push it out to all of our network and our peers so that everybody's got this same message and the drumbeat gets louder and louder and louder. I'm looking for a deafening cacophony,” she said.